Portugal's grind-it-out style paid off against a valiant Wales side, with Cristiano Ronaldo accounting for the difference in their Euro 2016 semifinal. LYON, France – With a goal and an assist, suddenly everything is right in the world of Cristiano Ronaldo. This may be the least entertaining of the seven Portugal sides to reach the semifinals of a major tournament, but it is only the second to reach a final, after a comfortable 2-0 win over Wales, and if Ronaldo’s role is simply to provide a cutting edge ahead of the hard-tackling midfield that is the true strength of the side, neither he nor they will mind. It’s a remarkable sleight of tactical hand that Fernando Santos has pulled to create a situation in which one of the greatest players of all time is a sort of bolt-on to the main body of the side, but Ronaldo is not the reason Portugal is in the final of Euro 2016. He played excellently against Hungary, but if Portugal had continued to defend as it did in that 3-3 draw, it would not have got this far. Santos dropped Ricardo Carvalho for Jose Fonte–tellingly, in the absence of the injured Pepe, it was Bruno Alves rather than Carvalho who came in–and reshaped his midfield. Since then, Portugal has conceded only one goal. Danilo Pereira had a useful game deputizing for the great clanking ball-recycler that is William Carvalho, but again it was the 18-year-old Renato Sanches who caught the eye, with his smoothly powerful runs punching holes through the Welsh lines. But still, while it was the midfield that stifled Wales, it was Ronaldo who provided the decisive blows, powering in a 50th-minute header before Nani turned in his mis-hit shot three minutes later. For Portugal it was a first win within 90 minutes in the tournament. Both sides had produced their best displays when counterattacking, which made it almost inevitable there would be a period of cautious feeling out of the opposition on both sides, with neither side particularly interested in taking the sort of risk that might have led to a cheap turnover. The result was the sort of caginess that, weirdly, turned the first half into something approaching the Bale-Ronaldo battle many previews had predicted. Bale was rather more dynamic that his Real Madrid teammate in the first half, which is not to say more dangerous. He linked up better with the midfield and, on a couple of occasions, went on forceful runs leading on one case to a 25-yard shot that Rui Patricio saved comfortably and, in another, to a dangerous cross. He also fired just over from a neatly worked corner as Joe Ledley cut the ball back low to the top of the box. Ronaldo, a less mobile, more attack-focused figure these days, had a ferocious battle with James Collins, brought into the side in place of the suspended Ben Davies to make his first start since being injured for West Ham against Tottenham on March 2. Ronaldo has slowly morphed over his career into a high-grade version of a classic No. 9, a muscular header of the ball. Because of his other assets, it’s a side of his game that is often overlooked, but here he gave as good as he got with an old-fashioned center half. He should have had an early penalty when Collins grabbed him in a headlock, but then he probably should have been booked for leading into an aerial challenge with his hip. Given he was later booked for kicking the ball away at a free kick, he perhaps is slightly fortunate to play in the final (although he surely wouldn’t have been so silly had he been on a yellow). By halftime, Ronaldo was visibly frustrated by the lack of service to him, but when he did get a chance, having been picked out at the back post by Adrien Silva’s cross, he headed over. That was his only touch in the Wales box in the first 45 minutes. His first of the second, five minutes after the break, was rather more decisive. As a left-wing corner was played short to Raphael Guerreiro, who slung it in to the back post, he rose above James Chester to power in a header. 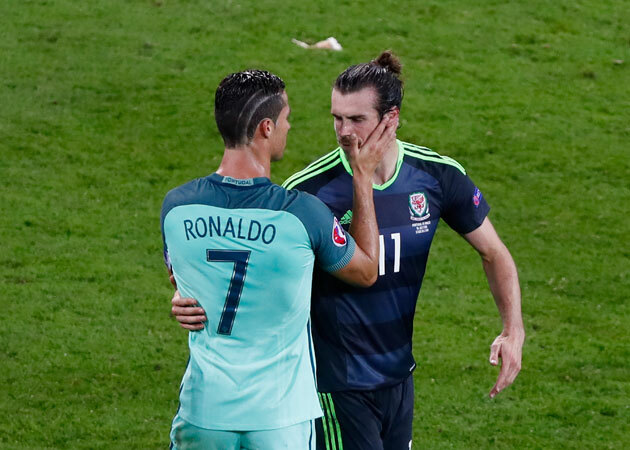 Wales was irritated that the corner had been given, claiming that Ronaldo had fouled Collins in the build-up. Its complaints about the second goal three minutes later were rather better grounded. A cross from the left was half-cleared to Ronaldo, whose mis-hit 25-yard drive seemed to be heading wide when a stretching Nani diverted it past Wayne Hennessey. Nani was onside, but Renato Sanches, who stepped over the shot, was offside and surely interfering with Hennessey's vision of the play. Still, other than a swerving long-ranger form Bale 10 minutes from Wales never really threatened to get one goal, let along two, and Portugal very nearly went 3-0 up as Danilo burst into the box and struck a shot that Hennessey grabbed at the second attempt. Wales’s fans serenaded their team to the end, like Iceland’s, determined not to let an exit sour the memories of what has been a remarkable tournament for them. But it’s Portugal, a grim, grinding Portugal with a brilliant extra part, that progresses to the final, looking for its first-ever international success.